Norman Dixon and Fast Cat. When Tom Clement, as a lad, wandered down to Paddy Freeman's Park in Newcastle-upon-Tyne, the home of the Heaton Club, one of the members, Norman Dixon acted as Tom's mentor. 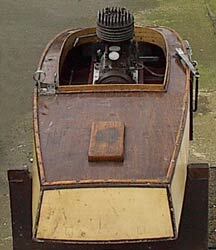 Norman had a pre-war Westbury designed kipper-box hull with a 30cc petrol 2-stroke engine that he built around 1938. 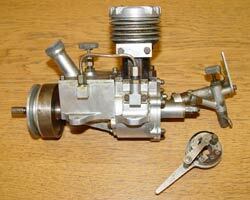 The engine was an EM 30, designed by W. Cooper and serialised in 'English Mechanics' magazine. 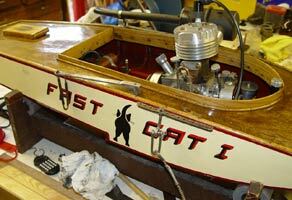 The boat was called Fast Cat I. 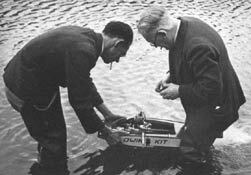 He also had a further two Westbury designed hydroplanes, Fast Cat II with his own designed 30cc 4-stroke petrol engine. 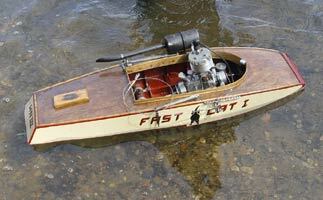 The other Qwik Kit with another Cooper designed engine, the EM 15cc 2-stroke, all three boats would run at about 30mph.On all his hydroplanes he had the rear view of a black cat with its tail up. Norman also ran a straight running boat called Camilla II. 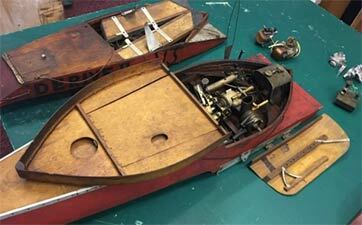 The hull was 5 feet 10 inches long, with a 34cc home designed 2-stroke petrol engine. 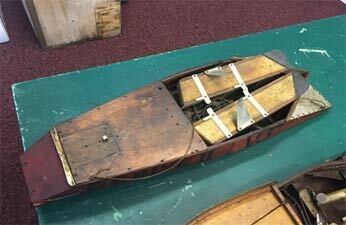 This was the boat that Tom used when he started travelling to other regattas. 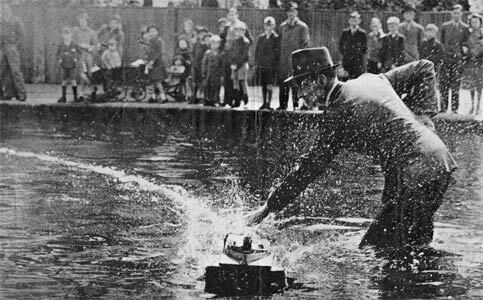 After Norman died Tom started running hydro's. 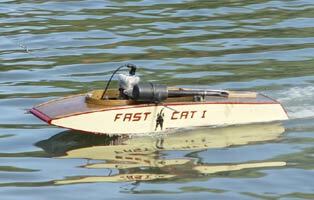 He put Fast Cat I's EM 30cc engine into a planing hull and achieved 40mph with this combination. 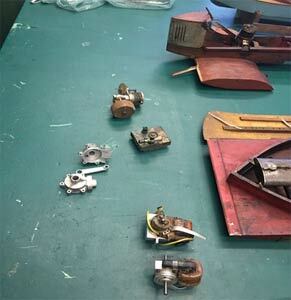 Tom has remained a member of the Heaton Club ever since, and still has Fast Cat I's hull and engine which he intends to restore at some stage. Thanks to Tom Clement for text and photo's, and to Andy Humpish for allowing me to use the original pictures. Since the above article was written in 2008, Tom has completed a superb restoration on Fast Cat and a rebuild of the original EM 30 motor. 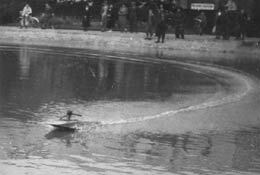 The first trial run at Kingsbury in 2010 was not a success due to the lack of a suitable propeller. Tom machined an entirely new prop from the solid which enabled Fast Cat to complete its first timed run in several decades. When switched to a lighter line the boat has proven to be thoroughly reliable and now has many more successful runs to its credit including the International regatta where it was the only 30cc boat to record a time. Tom is to be congratulated on bringing this boat back to life and seeing it running again has been one of the season's highlights. 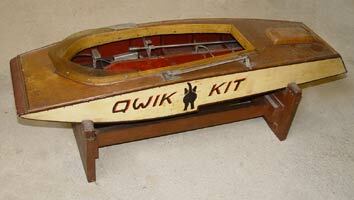 In the previous article reference was made to another of Norman Dixon's boats Qwik Kit. 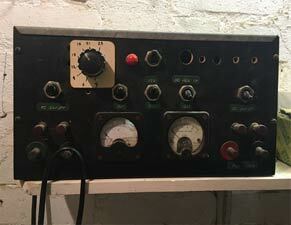 This was again complete and has been passed on to Tom Clement for restoration. The hull is in exceptionally good condition, but as described in a 'Pitbox' item in July 2010, the motor was something of a mystery. It was obviously a 15cc B Class motor yet was clearly not an EM 15 as that is entirely different in design. 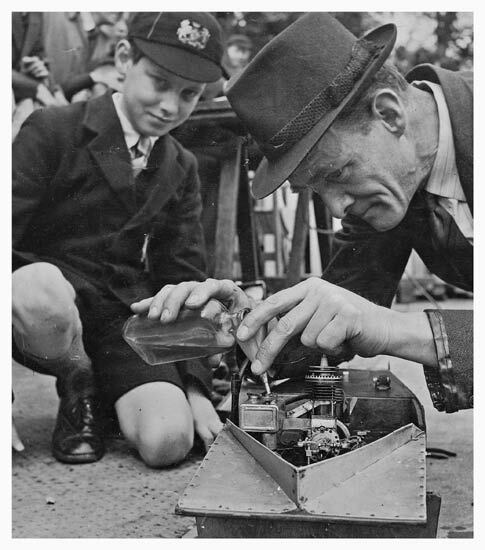 After careful measurement and comparison it transpired that Norman had built a perfect replica of the EM 30 in Fast Cat but scaled down to make it 15cc. 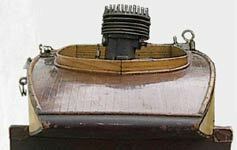 With the exception of the oil tank which is an original EM casting everything else was slightly smaller and had been fabricated or machined from the solid. It is a master piece of engineering in its own right. It was a real delight to spend a cold November afternoon in the fascinating company of Derek R Heath. 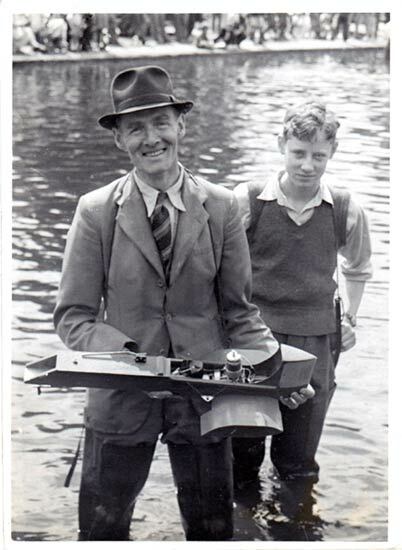 Derek had contacted Norman Lara as he was looking for a home for his late father’s (Harold Douglas Heath) beloved homemade hydroplanes which he ran in Victoria Park in the late 1930s. 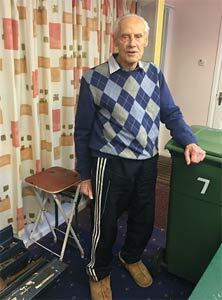 Derek was born in 1930 and lived with his family in Enfield. Prior to the war he remembers going by car to the Park. During the war they caught a tram from Enfield to Dalston Junction, then changing on to another tram to Victoria Park. Whilst mum would visit her parents, Derek and Dad went to Victoria Park. On occasions Derek vaguely remembers visiting his grandparents in Cawley Rd., Hackney in a house opposite the Park. In his memory his grandparents always were dressed very formally in black and they had gas lights and an aspidistra in the bay window. In 1941 Derek attended Tottenham Grammar School and usually wore a TGS school cap (men generally wore hats, either caps or trilbies.) There was a picture of him and his dad in the London illustrated News ("Model Husbands") and they had enquiries from as far afield as Australia after recognising his school badge. 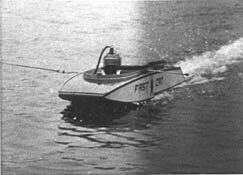 Derek remembers a VMSC member called Cockman, who ran a flash-steam hydroplane called IFIT. It was always very impressive to see it racing round the pole with flames and steam emerging from the back. When they arrived at the park, the members would bring their tools, fuels, spares and the like and go to area behind the clubhouse where there were fixed benches. There they could fire up the boilers and work on the engines etc. before going round to the lake to run the boats. 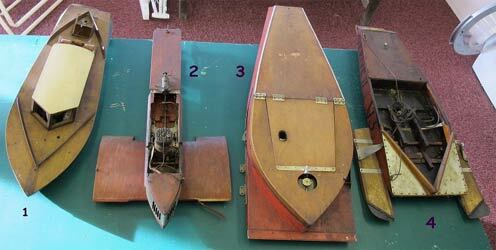 Larger boats could be stored in lockers in the boathouse (sadly now gone). Harold was an apprentice with Gnome et Rhone at their factory in Hackney. They made a range of nine cylinder rotary aircraft engines used in many early French and British aircraft in the 1st World War. 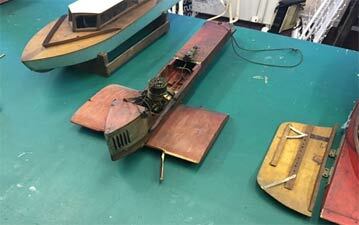 It was of course, a long slow haul from an engine sketch to a new running engine. Making the patterns, the moulds, the castings, and the machining. 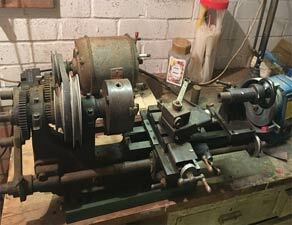 Machining the cylinder, flywheel, carburettors etc. 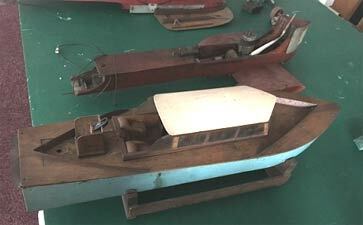 Then the hull and the fittings, the ignition system, fuel tank and so on, I guess maybe a year? Derek remembers the regattas which used to be packed. There was a little fence for the members area and the public came to watch. At times the crowds were six deep. The Heath family were at Victoria Park the day war broke out in September 1939, the air raid sirens sounded and Derek and his dad didn't know what to do, luckily it was a false alarm. 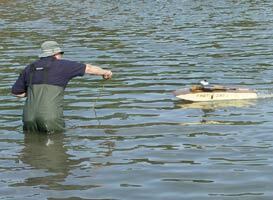 As the war went on activities on the lake gradually ceased. Rationing affected everything, materials, transport etc and activities did not resume until after the war. Derek's dad developed lung cancer from smoking and as his health deteriorated, he was unable to continue with the boats. He sadly died in Middlesex Hospital in 1946.